Try this thought exercise. You’re watching a tennis match between Novak Djokovic, winner of 15 Grand Slam singles titles, and a Cinderella performer getting his first taste of a final in a big event. Who are you cheering for? Well, most people would be pulling for the faint hope to have his day in the sun. Now, say you’re watching the same match but someone has given you $50 to wager on the winner. Who are you cheering for now? Of course you’re all over Djokovic and turning the $50 into $100. That’s how life really works. Investment is everything. Skin in the game. And why today’s politics of resentment don’t work. The earliest democrats reflected this concept when they designed the first constitutions. The vote, for the most part, would go to those with investments in property or businesses. It was believed, probably fancifully, that only those who stood to lose tangible assets could be trusted to manage the budgets of the state or decide on war. Time and custom have eroded the link between investment and the franchise to vote. Suffrage and desegregation opened the vote, and now any adults over the age of 18 who can make an X and fog a mirror (although there are doubts about the mirror part in certain neighbourhoods of Chicago) get a vote. No one sees that as a bad thing. Which has resulted in today’s system where some people vote their pocketbook. While others who vote their conscience. Publicly acknowledging this fact, however, is political poison. Mitt Romney, the GOP candidate for president in 2012, was caught suggesting that the 47 percent of the people who pay no taxes might have a different investment in voting than those who do contribute to taxes. He was roasted by his opponent Barack Obama. POTUS 44 was the president of the 47 percent, as he famously described his vision of how the economy can work only with government intervention. Obama seemed to be suggesting that government creates wealth. Which is so much bunkum intended to play class politics at election time. “Giving money and power to government is a lot like giving whiskey and car keys to a teenage boy,” observed P.J. O’Rourke. Or, as black historian Thomas Sowell has written, “No one can really understand the political left without understanding that they are about making themselves feel superior, however much they may talk piously about what they are going to do to help others." The results of the investment gap were obvious looking around the joint session of Congress during Tuesday’s State of the Union message by president Donald Trump. The wallets were sitting on theirs unless the president roused them to applause. 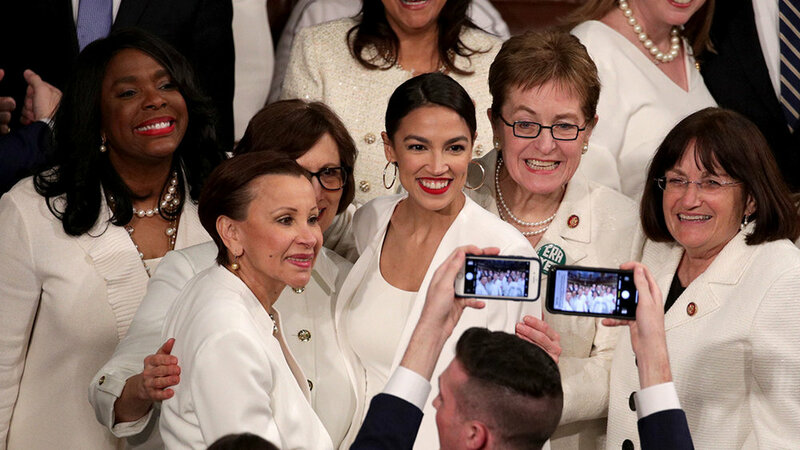 The conscience crowd, robed in white (freshman female members of Congress) signified their allegiance to deep-seated causes they want government to pay for. Namely, themselves. Alexandria Ocasio-Cortez’ new Green Act promises “Economic Security for Those Unable or Unwilling to Work”. Extending equal opportunity into equal outcomes. What Trump had to do— or pretend to do— was to be conciliatory to the uninvested while not knee-capping the economy. His comments on socialism— “America will never be a socialist country”— were the torpedo aimed at separating the gullible from the new wave of Obama acolytes such as Ocasio-Cortez. The people who want to replace merit with identity check lists. Ask Venezuela how that’s working out. A Happy Ways Fable: "You Knew I Was A Scorpion When You Met Me"